In the past week, I have been surrounded by amazing people, artists, singers and clients who are committed to living a life of purpose and pursuing their passions. I am grateful to have spent an afternoon at the spa with my best friend, an international recording artist who has traveled the world singing. I had a session with a producer who creates music for some of the most popular shows on television. I had daily meetings with my co-director, who has not only performed with top musicians in the business such as John Legend and Stevie Wonder, but is also certified in project management. It is so important to surround yourself by high-vibrational people who are taking their lives and their music to the next level. It is often said that you are the average of the 5 people you spend the most time with. Which 5 people are you spending the most time with? Remember, Superstars: the 5 people you spend the most time with, you become! As artists, we must be especially aware of who we surround ourselves by. This brings me to a related subject that has come up a few times lately in the lives of my clients...haters. I remember that when I first started to really put myself out there, I was worried sick about what everyone else was going to think--everyone meaning my friends and family. Sure enough, when the time came, those closest to me had some unkind things to say. But I kept going. As I expanded and began working with professionals in the industry, I crossed paths with bandmates and producers who had things to say and belief systems that just did not resonate with my mission and goals. I was also able to handle that just fine, because I kept going. In the past year, after investing so much into growing my vocal coaching business, life and career, I carefully removed all negative people from my life. However, negativity still finds a way to seep in every now and then. The truth is, everyone is entitled to their own opinion. But it hurts when people say insensitive or downright mean things, especially when shared in unsolicited ways on social media. I have learned that not everyone has something nice to say. I recently received a mean message online from someone that I don't know. So for those of you who are really putting yourself out there and being visible online and in your local communities, just know that behind every successful person, there's usually a pack of haters. People frequently ask me why my singing programs start with a focus on mindset work. Well, one of the BIGGEST reasons is because singing success is not always easy. You need mental and emotional strength to keep going...especially once the haters are on to you. To be able to climb to the top of any profession, whether you want to be the next president, own your own television network or become the next Taylor Swift, you must learn how to handle negativity. Over the past year, I have had to do my own mindset work to keep going and to free myself from the negativity that can drag you down. 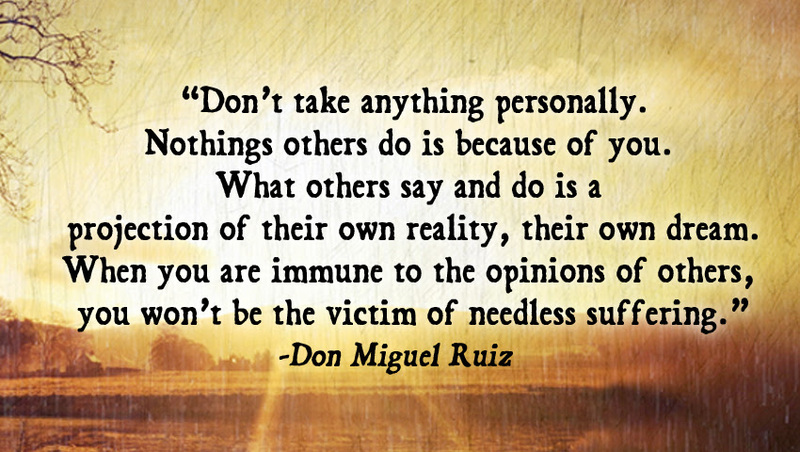 Don Miguel Ruiz emphasized this concept as the 2nd agreement in his best-seller, "The Four Agreements". The 2nd Agreement from The Four Agreements: "Don't take anything personally!" This is especially crucial as singers! So often, one of the most common statements I get from new clients is, "I wish I had never stopped singing." Usually the cause of days, months and even years of singing silence and neglect was because of something someone said to them...and sadly, they believed it. When you are immune to the opinions of others, you won't be the victim to needless suffering. Life is short. If you are going to pursue singing, then sing! As Taylor Swift says, "The haters gonna hate, hate, hate, hate, hate. Baby, I'm just gonna shake, shake, shake, shake, shake, I shake it off, I shake it off." As powerful singers we have to surround ourselves by positive people and stick together! This is why I am so passionate about coaching! If you are ready to keep taking action towards your creating your dream voice and career you were born to have, then get the support you need.